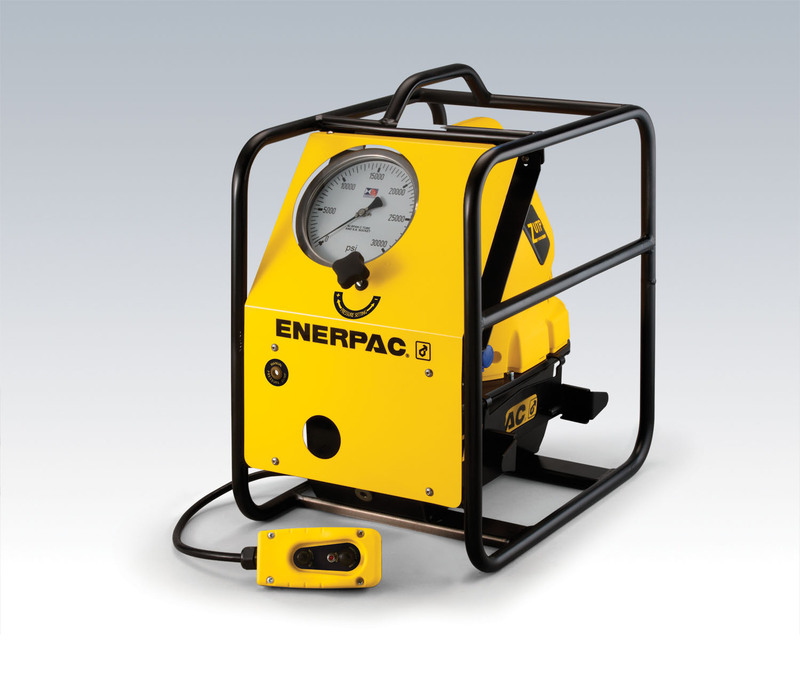 Enerpac introduces the ZUTP1500 Electric Tensioner Pump with Remote Controlled Valve, the latest addition to the company’s robust line of ZUTP-Series Electric Tensioning Pumps. Enerpac introduces the ZUTP1500 Electric Tensioner Pump with Remote Controlled Valve, the latest addition to the company’s robust line of ZUTP-Series Electric Tensioning Pumps. This series features a two-stage pump design to provide high flow at low pressure for fast system fills, as well as controlled flow at high pressure for safe and accurate operation. Designed for the demanding needs of the wind turbine market, the new ZUTP1500 is the only electric tensioner pump on the market to feature a remote-controlled electric valve and universal motor without a hydraulic intensifier. The resulting pump facilitates hassle-free operation of bolt tensioners and hydraulic nuts in remote locations. With a low-pressure flow rate of 230 in3 per minute and a full-pressure flow rate of 20 in3 per minute, the new three-piston, two-stage pump design powers bolt tensioners up to two times faster than competitive pumps. Since the ZUTP1500 is able to generate 1500 bar (21,750 psi) of pressure without the use of an intensifier, it is less sensitive to contamination in the hydraulic fluid, more reliable and offers a lower operating cost than similar competitive units. Plus, the design is rugged, lightweight and compact, providing an ideal fit for tight openings common in space-restricted wind turbine applications. Also delivering an ideal solution for bolt tensioner and hydraulic nut applications in the mining and power generation industries, the feature-rich pump is prepared for immediate use and built for fieldwork. The ZUTP1500 includes a durable, lightweight aluminum roll cage and reservoir with a sheet metal front panel to guard the pump from the rigors of the worksite. With a high-efficiency pump design and heavy-duty universal motor, the ZUTP1500 has a cooler operating temperature and draws less current than similar competitive pumps, delivering higher productivity for applications in remote or low-powered areas. The simple-to-operate ZUTP1500 includes a 20-foot pendant cord for remote control of both the motor and valve, delivering hassle-free operation and increased productivity. This is ideal for wind turbine bolt tensioning applications, since it allows single-person operation. For improved visibility and safety, a large 6-inch pressure gauge with a polycarbonate cover is prominently displayed on the front panel. Additionally, a user-adjustable pressure control valve is mounted on the front panel for easy access, allowing the user to safely and precisely set the pressure. The ZUTP1500 is compatible with all brands of tensioners that require up to 1500 bar (21,750 psi) of pressure. Enerpac is an international market leader in high-pressure hydraulics, with 28 offices in 22 different countries and over 1,000 employees. 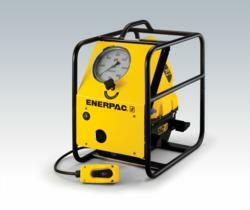 Enerpac produces thousands of high-pressure hydraulic products that are distributed worldwide. Enerpac focuses on the design of products, from the smallest cylinder to complete computer-operated lifting & positioning systems, which increase productivity and make work safer and easier to perform.